There are a lot of strategies for tracking and following up on abandoned carts. 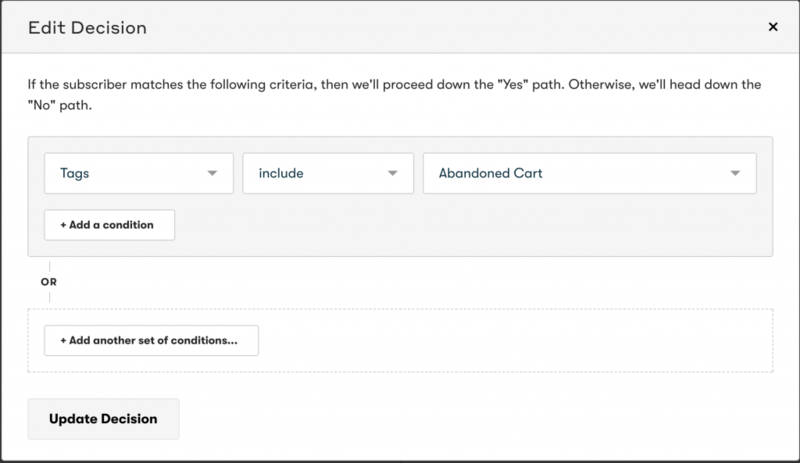 This guide will provide an overview of how to set up a basic abandoned cart tracking workflow for Drip. First, go to the Addons tab under the WP Fusion settings and select a tag to be used for abandoned cart tracking. You use an existing tag, or type a new one into the box. WP Fusion will automatically apply this tag to the user when checkout is begun, and the tag will be removed if checkout is completed successfully. Next, log into your Drip account, select Workflows from the Automation dropdown, and create a new Workflow. The automation should be triggered when the “Abandoned Cart” tag is added. Add a timer (one hour is usually a good amount), and after the timer create a decision like in the picture below. Anything under the “Yes” part of the decision will be run if the contact has begun checkout but hasn’t completed it within the specified time. From here you can add the contact to a list, send an email, and/or create an internal task for further followup. 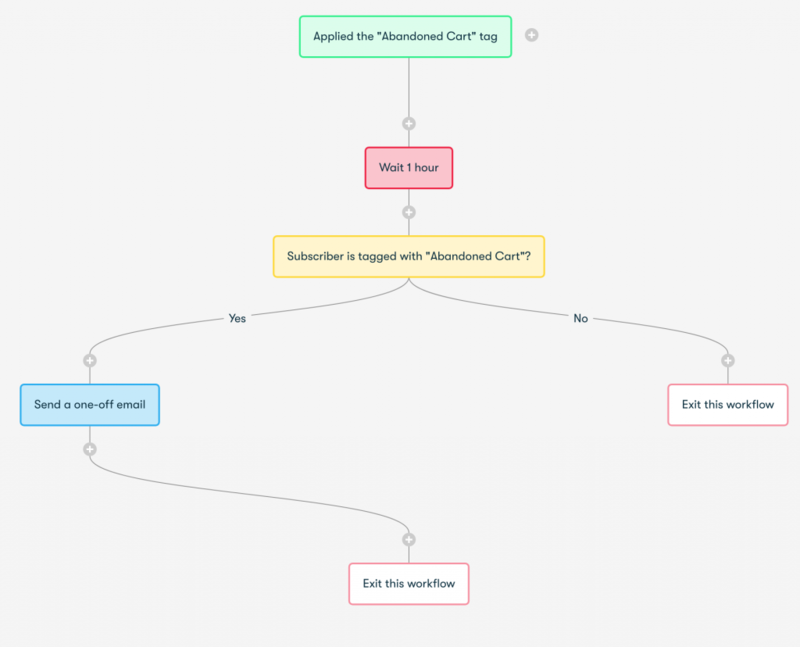 See the image below for an overview of the entire automation. In this example we wait for one hour after the cart was abandoned, then send a one-off email to the customer to follow up. WP Fusion supports saving a customer’s abandoned cart in WooCommerce and syncing a recovery URL to Drip, which can be sent in an email. To set this up, enter a field to be used to store the cart recovery URL. Then in your abandoned cart email (see above), insert a link, using the Liquid Tag for the recovery url. 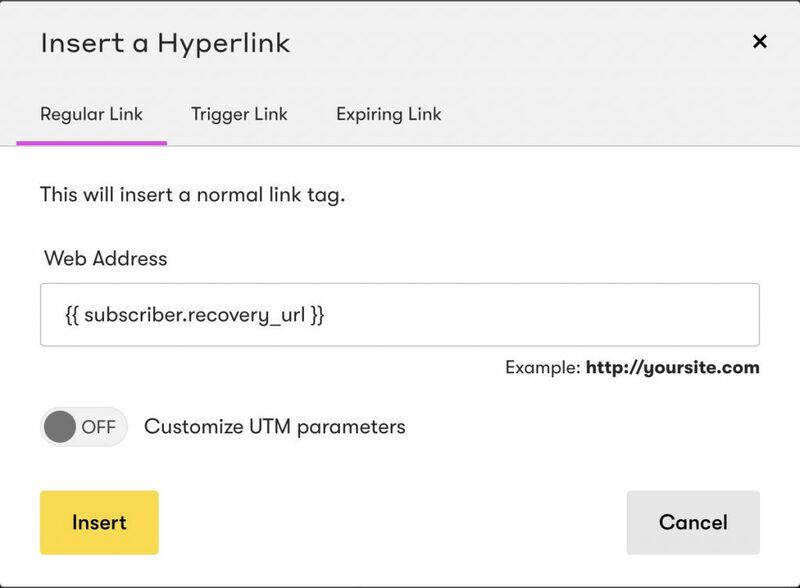 When the customer clicks the link in the email, they’ll be taken to the WooCommerce checkout with their cart contents restored.